There is no one dress code for every business or industry in the world. Most businesses that are considered to be in the corporate sector have similar office dress codes. As women, we often try to dress the part by relying on the clothing we see in the career section of department stores. We get office dress ideas from magazines and blog. Are these resources actually helping you or hurting you professionally? If you look at the career section or "wear to work" section of many department stores, you will see a mixture of styles. Some are the more streamlined business attire, while others tend to look more like after work and weekend attire. I've never had a work dress code that allowed you to wear miniskirts or skirts that fell at mid-thigh. Shorts are rarely acceptable and strapless anything is out of the question. However, when you look at some department stores wear-to-work sections you will see these items. To avoid falling into the trap of wearing some of the inappropriate styles department stores place in their career sections follow these four simple guidelines that ensure you will dress professionally. This might sound weird considering you may already be working at the company you want to work for. Are you satisfied with your current position and pay scale? If the answer is no, then you should start dressing for where you want to be within the company you work for. If you work in an open office without much contact with important internal and external clients then you can probably take more liberties with your clothing. Modern-day business casual attire may suit you fine. If you want to move up into a higher position and make more money you need to dress for success. Adhere to the dress code in its literal sense. If the dress code has casual Fridays, then go preppy casual by mixing colored jeans with a blazer and wearing a pair of dress loafers. If you are going to a meeting that includes other departments or external clients/partners, a professional dress code is needed. A pant suit or skirt suit is best. Make sure your skirt is no higher than your thumb's length above the knee. A suit jacket worn over a dress shirt with no more than two buttons undone is best. For shoes, look for heels no higher than two and half inches high. Leave the platform pumps at home. Also, wear a closed toe shoe, you can show off your pedicure on another day. Keep jewelry modest and at a minimum. Stud earrings, a thin chain necklace, stylish watch and modest ring are the best choices. If you need to wear a belt, choose a thin one that is leather or leather-like or a modest chain belt that will fit through the belt loops, not over them. This does not mean you have to wear neutral colors from head to toe. You should wear mostly neutral tones in your professional dress. Instead of the red suit, choose a black or white suit with a red dress shirt for contrast. Save metallics for your accessories like your shoes and handbag. Black, white, browns and shades of muted gray tones (encompasses many colors) are best. For example, if you want to wear a purple skirt suit skip the brighter grape shade and go for a smoky (gray) mauve or lavender. You can wear prints but choose wisely. Printed dresses and skirts in a black/white print are safe because they successfully pair with a simple black or white suit jacket. Printed pants are hard to look good in. I would not risk it. These four guidelines are to be applied and adjusted based on your office dress code. Remember, department stores and magazines will show you what they think looks stylish, not what will get ahead at work. Remember, when in doubt, borrow from the fellas! 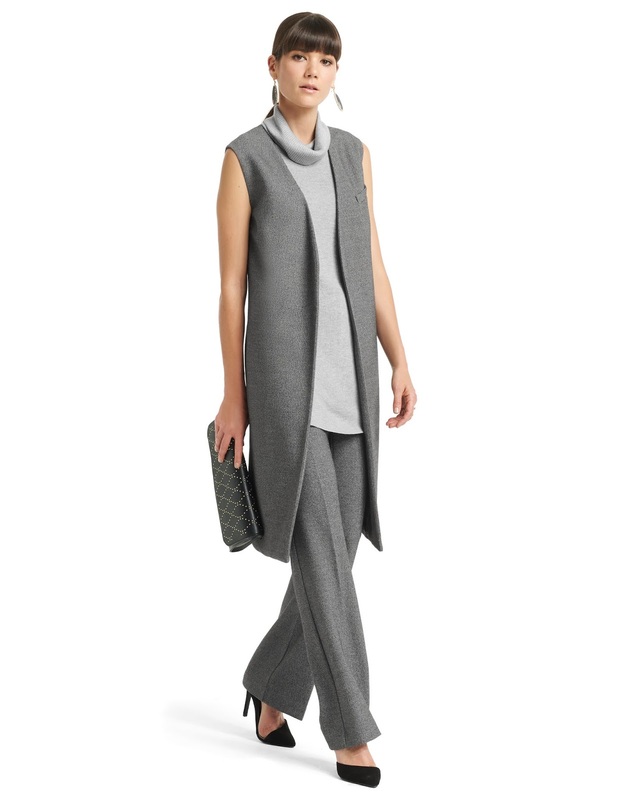 Main Image: Macy's Inc from the fall collection Alfani Sleeveless Turtleneck, $69.50. Sleeveless Coat, $129.50. Cigarette Pants, $79.50. All items are stylish, modern, and business casual.